Two faith communities and a faith network welcomed refugee families to Montgomery County this year. Many more communities are supporting refugee families and exploring sponsorships. Here is an overview of three of the efforts, along with advice from the organizers for other faith communities. “Yearning to Breathe” is an eight-min documentary created by Blair High School students about the Montgomery County faith community’s effort to welcome new neighbors. 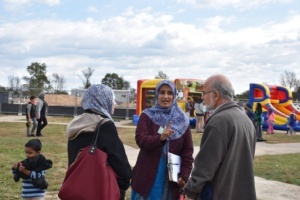 It features the refugee resettlement efforts of Chevy Chase Presbyterian Church, Montgomery County Muslim Foundation and Montgomery County Interfaith Refugee Resettlement Neighbors (MCIRRN), a network of 17 faith communities and other groups. Chevy Chase Presbyterian Church (CCPC), Washington, DC: In March 2016, CCPC welcomed a Syrian family that lives in Silv er Spring, working in partnership with the resettlement agency Lutheran Social Services (LSS) based in Hyattsville, MD. CCPC’s initial commitment was to locate an apartment and provide rental assistance for four months and to mentor the family for one year. However, they are expanding their commitment, due to the generous response of the congregation. Contributions include: furnishing the apartment, English tutoring, transportation to appointments, tax assistance, and hosting potluck dinners and play dates for children. Click here for an interview with Co-coordinator Merritt Groeschel. For more information, email: ccpcrrtf@gmail.com. Temple Shalom in Chevy Chase: In August 2016, Temple Shalom of Chevy Chase began sponsoring a Syrian family through the Hebrew Immigrant Aid Society (HIAS) Welcome Campaign. After partnering with Lutheran Social Services, the organizers attended a LSS seminar on sponsorship and met with Chevy Chase Presbyterian Church to learn about their experience. The temple formed a “Refugee Response Team” and committees for the family’s various needs: apartment set up, financial literacy, employment, English tutoring and trefugee-response-ministryransportation. Temple Shalom’s advice to others: 1) Soon after initiating the effort, find storage space and start collecting donations of household furnishings; 2) Find a translator—Arabic most often needed; and 3) Start recruiting volunteers and assign them to specific committees or tasks. See a recent article on the Temple’s effort: http://www.hias.org/blog/syrian-family-lands-maryland-gets-big-welcome-local-synagogue For more information, contact: Sara Nathan, sonathan06@yahoo.com. Montgomery County Interfaith Refugee Resettlement Neighbors (MCIRRN) or “Neighbors”: In 2 015, several Muslim, Christian and Jewish communities and concerned individuals formed the Montgomery County Interfaith Refugee Resettlement Neighbors (MCIRRN) or “Neighbors” to assist refugee families. 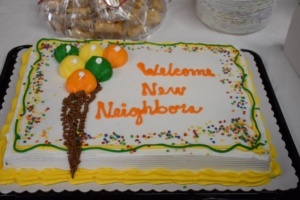 Coordinated by the Islamic Center of Maryland (ICM), Neighbors established a partnership with the resettlement agency Ethiopian Community Development Council (ECDC), based in Silver Spring. Neighbors is currently assisting 13 families from five different countries (Syria, Afghanistan, Sri Lanka, Sudan and Cuba). Their effort is organized by committees, including: Housing, Employment, Education, Health, Orientation/Mentoring, Social, Furnishings, Supplies and Food and Translation. Once employment in Montgomery County is secured, Neighbors would like to resettle eligible families in Gaithersburg, Germantown, Silver Spring & Rockville so they can be “real” Neighbors to the new families. Their goal is to help the families be independent and self-sufficient as soon as possible. Once families can sustain themselves, slots are open for new families. 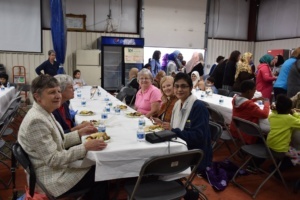 Neighbors recently held a Welcome Event for the families and the community at the Islamic Center. Communities and individuals (faith and secular) are invited to join Neighbor’s effort and they are available to provide presentations on their work. Identify a caseworker (or someone with casework experience) among your volunteer group. Work with federal resettlement agency offices in Maryland, as they have a wealth of information and resources. Tap your community, as it is rich with volunteers. Give your community hands on experience, but be aware of protecting the families’ privacy. Provide cultural sensitivity training to all involved. Be aware of HIPPA (medical records privacy law) guidelines. Provide a spiritual link to a faith community for the family, as appropriate. Be cautious about making information and pictures about the families available to others. For more information, contact: Shahnaz Baten, Co-Founder and Case Manager at MCIRRNeighbors@gmail.com or Bob Cooke, Outreach Committee Chair: cookerh1251@gmail.com.